UPDATE: I blogged about Dishoom a couple of weeks ago, but we went again for the Weekend of Food 2014 and it was magnificent. The best thing about going out with a lot of people is the opportunity to taste way more dishes! 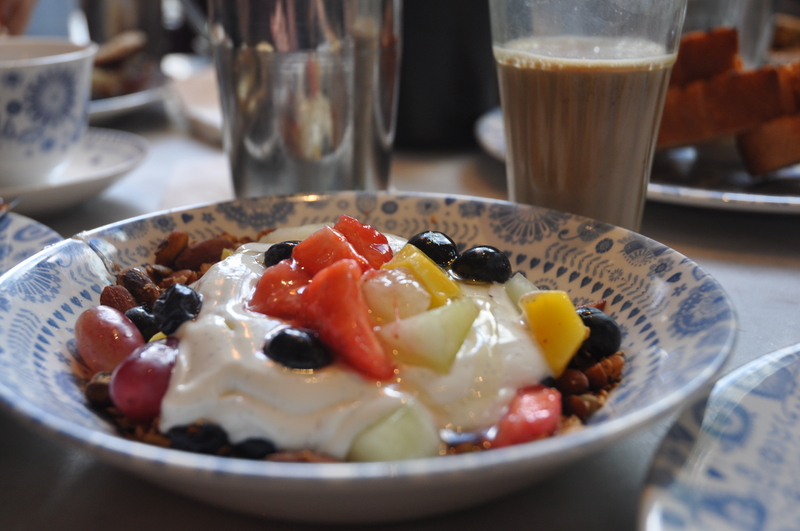 I finally tried Dishoom’s granola of destiny, and I have since vowed never to eat any other granola ever again. It is drizzled with yogurt of the gods, packed with gloriously fresh fruit, and toasted to perfection. I dare you to try it and not be completely bowled over! 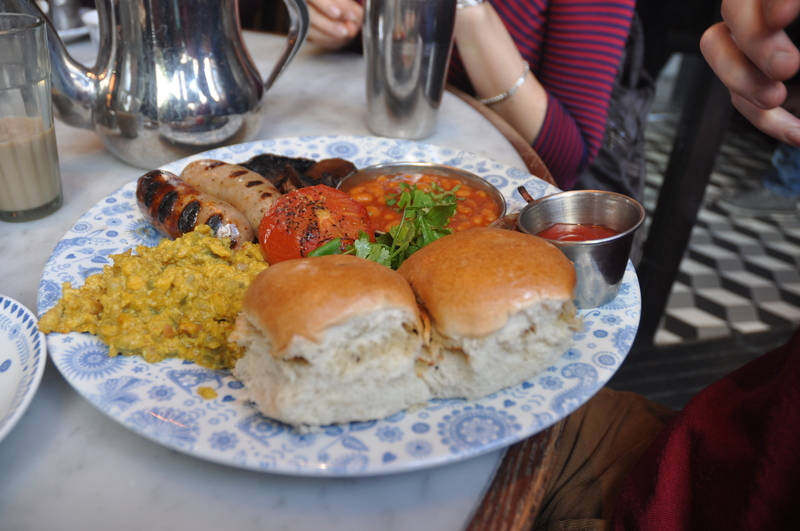 A friend of mine also had the Big Bombay, which was an inventive twist on the full English breakfast, comprising of akuri (Indian scrambled eggs) and masala baked beans, amongst others. 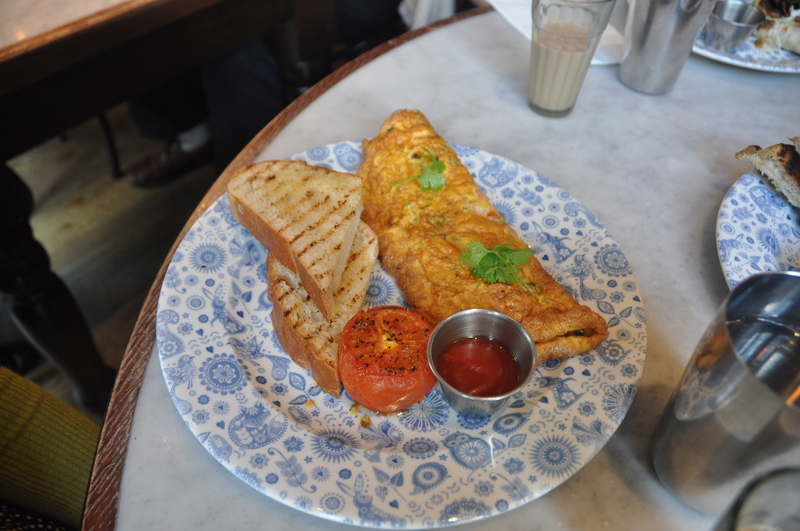 We also had bottomless chai, far too many (and yet not enough) bacon naan rolls, Fire Toast, and a Bombay omelette. It was heavenly, and I can’t wait to go back! I’ve been to Dishoom a couple of times now. In fact, it was one of the first restaurants I visited in London, even before I moved here. I love the Bombay Café decor, the sight of the upside-down tawa, the huge stretchy roomali rotis, the pictures on the wall, the smell of home, and of course the actual food itself. But before this weekend, I had never eaten breakfast here. Their lunch and dinner menu is fabulous, and I distinctly remember their murgh malai (the gravy… mmmmhh) and paneer tikka (anything that involves paneer gets me salivating). Their breakfast menu, besides being delightfully eloquent, is quite extensive and whilst it sports a couple of items that could be classified as Western with an Indian twist, some are distinctly Indian – my grandmother always used to make me the ‘Bombay omelette’, with onions and fresh green chili! Dishoom is particularly famous for their bacon naan roll, which falls under the fusion category, but is none the less delicious for it. I went for the egg naan roll, which sounds simple, but was made outstanding by perfectly runny yolks and delicate spices. The Darjeeling tea came in a huge pot and they gave us a free top-up of hot water without any trouble at all. The prices are incredibly reasonable – if you consider that most places, especially in Central London, will charge you £9 for an omelette, the egg naan roll at £4.70 and the bacon roll at £5.20 is a bargain. If you like breakfast with a twist, be sure to make a reservation and get there before 12. The service is attentive, the atmosphere and decor are delightful, the prices surprising and the food is finger-licking good, so it’s no surprise it’s so popular. I will definitely be visiting more often! 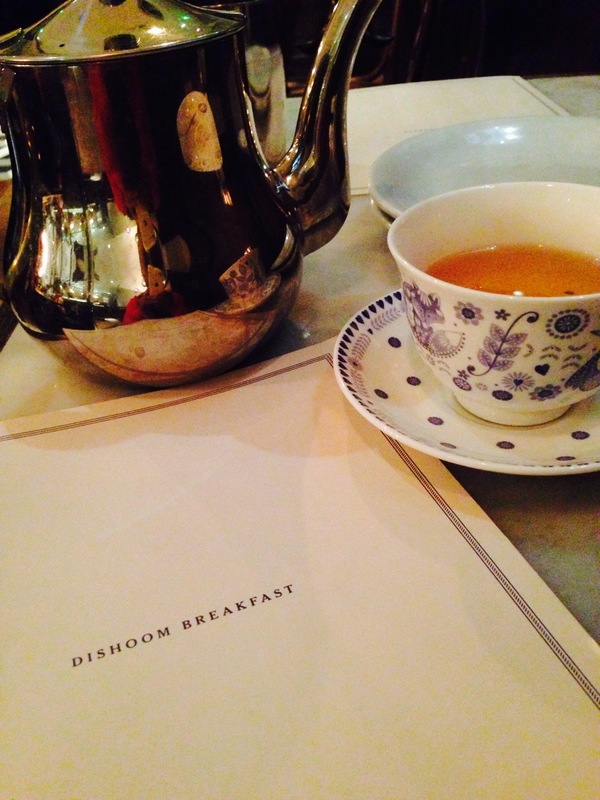 An updated review of Dishoom post-Weekend of Food 2014!